The constant energy from currents can be transformed into energy via turbines in the same way that the wind powers turbines. 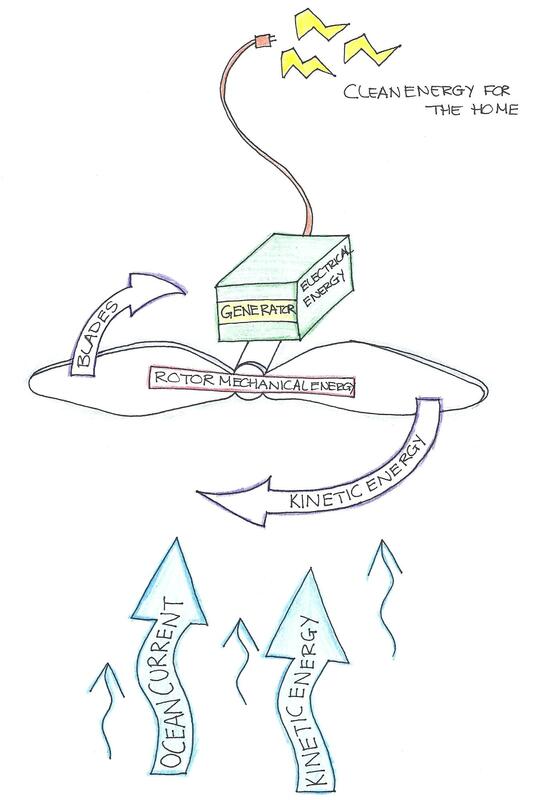 The kinetic energy of the moving water causes the blades of the turbine to rotate, causing the gearbox to turn with mechanical energy (Ahmed and Shoyama, 2011). The gearbox is connected to the generator, which produces a direct current, a form of electrical energy. This electricity is conveyed to shore via underwater cables and is then converted into an alternating current (used to power all electrical goods) and dispersed to consumers through the existing grid. To view a simple video of how tidal turbines work, Click Here. Ahmed, Emad M., and Masahito Shoyama. “Enhancing The Performance Of The Marine And Tidal Current Converters Using DC-DC Boost Converter.” Journal Of Energy & Power Engineering 6.3 (2012): 478-484. Academic Search Complete. Web. 15 July 2012. Great article. I was actually inspecting constantly this weblog and also I feel! Exceptionally valuable data exclusively the last part I look after such details a whole lot. I was pursuing this specific details for a long period of time. Thank you and also good luck. I am impressed, I need to mention. Definitely hardly ever perform I uncovered a blog thats both helpful as well as enjoyable, and let me tell you, youve reached the nail on the head. Your post is actually exceptional; the concern is something that not many folks are actually chatting smartly approximately. I am actually truly delighted that I came across this in my search for something associating with this.